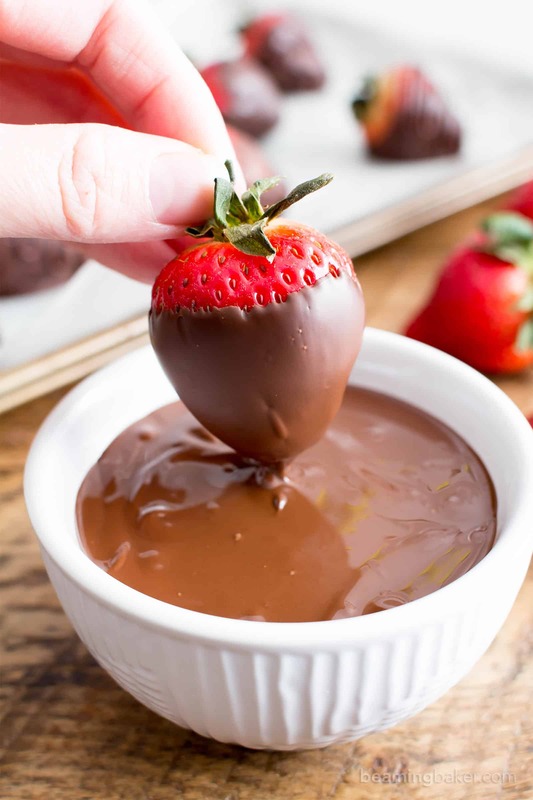 How to Make Chocolate Dipped Strawberries Recipe (V, GF): learn how easy it is to make beautiful, decadently delicious chocolate dipped strawberries with just 2 ingredients! 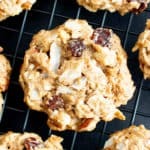 Vegan, Gluten-Free, Dairy-Free, Paleo. Plus, a video! First there was 5 minute homemade fudge, and then there was this how to make chocolate dipped strawberries recipe!! Wait a minute, was that a sentence?? Eh, whatever! Back on point… of course, there were still some less decadent treats to keep our healthy snack vibes going. 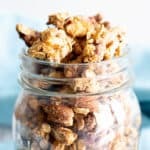 Did you try my Homemade Chunky Paleo Granola with Clusters? One of my absolute faves right now, but so not the theme of today/beginning of February, which is: CHOCOLATE!! Have you ever learned how to make chocolate dipped strawberries? If so, did you make them with dark chocolate, white chocolate, or even… oooooh, strawberry chocolate? Strawberry on Strawberry vibes sound incredible! 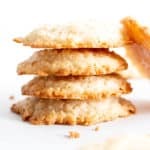 When I started working on this recipe—I know, how dare I even call it that with just 2 ingredients involved—I thought I was gonna to go all out on decorating these babies: crushed almonds, sprinkles, strawberry-flavored drizzle. But as I was making them, I realized that these strawberries needed no further sassing up. Okay, alright, I’ll admit it, I couldn’t help myself from getting my drizzle game on (like, have you seen the drizzle on these: paleo chocolate coconut truffles, vegan chocolate peanut butter truffles, dark chocolate sea salt kind bars). And I felt like some fancy pro chocolatier drizzling these chocolate dipped strawberries. Still though, the beauty of these just speak for themselves. Don’t you want to just dive in and grab one/ALL of these? 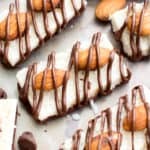 The best part: they’re SO easy to make! 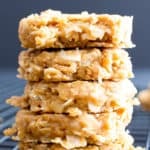 Okaaaaay, not as easy as let’s say, spreading almond butter on toast, but still easy! Probably the most tedious part is washing and fully drying the strawberries. Which, let’s face it, I handed over to Erik. ???? Afterward, all you have to do is line a baking sheet or plate with wax paper. Then, melt the chocolate and dip! The rest is up to you—whether you want to drizzle, top, or even glitter (!!) these. It’s all up to you as you learn how to make chocolate dipped strawberries! Allow them to set afterward at room temperature, or give them a quick boost in the fridge. I prefer letting them set at room temp. Also try this super tasty and deliciously fruit-filled Watermelon Pizza from Everyday Maven! I love that it’s such a fun way to enjoy so many bright and colorful fruits. 🙂 Then, when you’re done making that, head on over to my Vegan Gluten Free Blueberry Crisp to get your blueberry on! 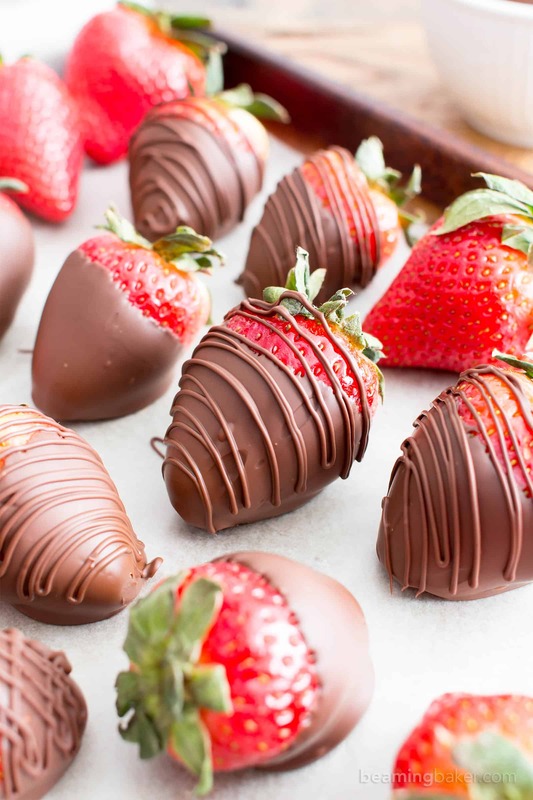 just the strawberries dipped in chocolate recipe you’ve been looking for! What’s the best Valentine’s Day gift you ever got? 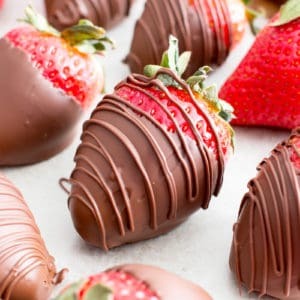 How to Make Chocolate Dipped Strawberries Recipe (V, GF): learn how easy it is to make beautiful, decadently delicious chocolate dipped strawberries! Vegan, Paleo, Gluten-Free, Dairy-Free. Wash and completely dry strawberries. Keep leaves intact to allow for easier dipping. Set aside for later. Line a large baking sheet with wax paper or parchment paper. Set aside. Use the double boiler method or the following to melt the chocolate. Add chocolate to a small, microwave-safe bowl. Heat in 20-second increments until melted. Stir in between heating increments, until smooth. Holding one strawberry by the leaves, dip until mostly coated. Place onto prepared baking sheet. Repeat for all strawberries. 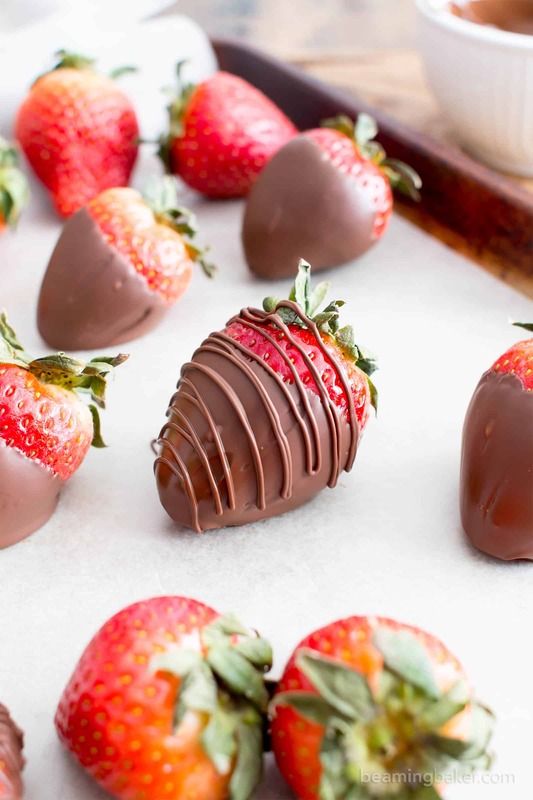 Optionally, melt 2 tablespoons chocolate and drizzle strawberries or top with sprinkles, nuts, and more. 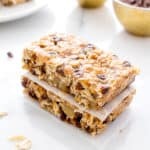 Allow to set at room temperature (25-45 mins, more depending on temperature in your kitchen) or refrigerate until chocolate is completely hardened, about 10-20 minutes. Enjoy! Storing instructions below. - Storing Notes: best if served within a few hours. - If making ahead of time, note that storage time is maximum: 6-8 hours. Store at room temperature, uncovered, in a dark environment, or in the refrigerator, uncovered. Strawberries will begin to weep around the 4 hour mark. 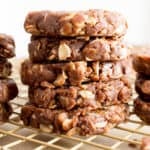 - More sweet treat recipes: paleo almond joy, best vegan brownies, 5 minute homemade fudge. These are so pretty! I love the swirly design – and that they’re healthy! You just can’t go wrong with chocolate dipped strawberries – though believe it or not — I’ve never done it. I will rectify that oversight — and I’m going all out with that drizzle too. You really can’t! 😉 You’ll have so much fun, for sure. 🙂 Oh YES on that drizzle! Oh yes!! They’re so quintessentially V-Day! 🙂 Thanks so much! Strawberries covered in strawberry chocolate, that’s just insane! Wait….or maybe it’s the most genious thing EVER?! 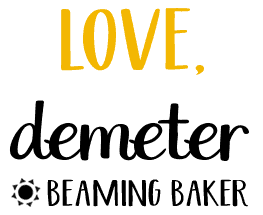 Hahahaa love your way of thinking Demeter! 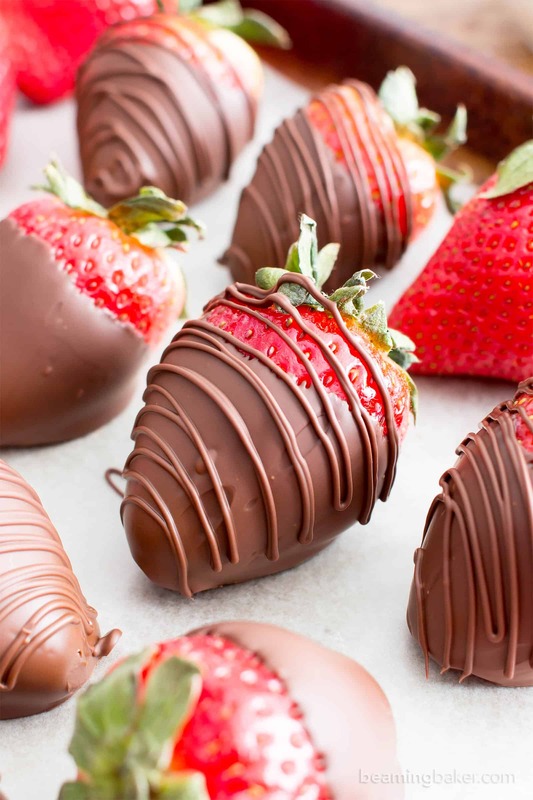 These chocolate covered strawberries look gorgeous! Those drizzles are true perfection though. 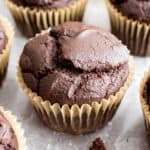 Did you use a piping bag? 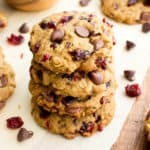 where do you find a chocolate chip that is refined sugar-free, paleo, vegan, gluten-free, dairy-free? These look delicious- perfect in time for Valentine’s Day! 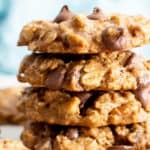 I’m curious- do you know how they make paleo chocolate chips? They’re so delicious and simple! Enjoy! You make it so easy! Just in time for the big day. My daughters love making chocolate dipper strawberries for Valentine’s Day! So pretty and festive! Who needs to buy these now when you can make them! What a great idea for Valentine’s Day! I really love strawberries! I love that I dont have to spend a ton of money on these now! These are so pretty! What kind of chocolate did you use? It looks like milk chocolate. Thanks. Hi Bonnie! For this shoot, I used Guittard semi-sweet chocolate chips. Accidentally vegan, as it were! 😉 But try Enjoy Life or another dairy-free brand if you’re looking for allergy-friendly or paleo chocolate. Do you recommend to add 2 tbsp of vegetable oil?